"So why are we here, exactly?" asked Candon. "Haven't found out yet," replied Suisse. "All I know is it's Code 14, top clearance." He enunciated the next part with careful mocking precision. "Should see En-Quaitant-do-Miérz Portres in here soon enough." He snapped his finger. "Yup, there he is. Start smiling." Portres was making his way toward them. He was a tall gentleman, about fifty years old, and he walked with a purposeful strut that came off just a tad too calculated. With a cultured flourish, he took his seat next to the other two. "Counsel. How are the kids?" asked Suisse. "Oh, you know," replied Portres. "Annoying their parents, going against the grain, experimenting with trodes and bodymods and what-have-you. It'll pass." He placed his case on the table in front of him and unclasped it. "Any idea why we're here?" asked Candon. "Something about a new security directive. I'm not sure," replied Portres. "You'd think they'd brief us properly," said Suisse. Portres nodded. "Yes," he said, "I suppose it was all rather vague and hurried." He pried his d-pad from the case's foam inlay, placed it on the table in front of him and began powering it up. "Comfortably certain it's all part of a plan, though," he said, unbuttoning his jacket. "Let it seldom be said our new President doesn't know what he's doing." "Let it never be thought, much less said," muttered Candon. Portres straightened in his chair, smoothed his lapel bottoms. "Well," he said, "at the very least he provides the illusion of knowing what he's doing. Right now, maybe that's what we all need. I know he's convinced me so far, and I'm a fairly hard man to convince." "That much is true," said Candon. 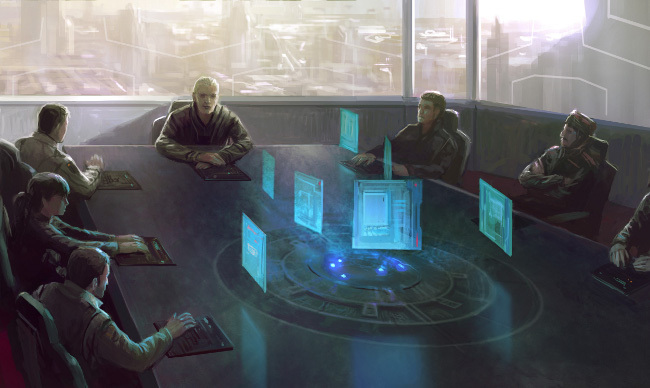 They sat there in silence for a few seconds while the meeting table’s holographic center cycled through its test patterns. About ten minutes later, with the formalities concluded and the heads of the Federal Intelligence Office's fifteen major divisions settling somewhat uneasily into their seats, the slight, bald figure at the head of the table began to speak. "I'm sure most of you gentlemen are wondering why you were brought here this afternoon on such short notice, and with such dramatic urgency," he began. "Just as I'm sure many of you realize that the act of bringing you here in such a way can be an end unto itself." A few heads turned around the table, but barely a sound was heard. "As of 9:00 AM this morning, I have issued a presidential directive that places specific orders in the hands of each and every one of you. Your dossier pads have been updated with the relevant information. Use the holofield to your convenience. As you review the data, bear in mind that if even one bit of this information finds its way into the wrong hands, the whole operation will come down on your head." He paused for one second, then continued. "As you will learn, the impromptu Code 14 meetings will continue for the next two weeks. They are an unfortunate necessity, but crucial in the grander scheme." He lowered his head. The room was silent. "Thank you, gentlemen. Please take your time to review your orders. They are effective immediately." Without another word, he turned, strode away from the table, and vanished through a side entrance, the subdued slither of his entourage trailing behind him. Candon and Suisse looked at each other. Portres stared down at his d-pad stream. One by one, the three men went to work. The hall was gigantic, tastefully adorned in traditional Caldari style and dotted with artistic recreations of State exploits commissioned by the State’s most beloved artists. The exclusive crowd in attendance, however, were far more interested in the other people around them than in their exorbitant surroundings. "Mister Kaikumi. Good to see you made it." "How have things been, Miss Omura?" "Staying on an even keel." "Good to hear. I understand you've been expanding into new markets recently?" "Always on the prowl. Expansion is the lifeblood of our economy." He made a sudden awkward shuffle, backed up two steps. "My apologies. Miss Omura, allow me to introduce a friend of mine. This is Katiana Rigomi. She's an Achura investor of some repute. Katiana, this is Jaan Omura, the CEO of Caldari Funds Unlimited." The girl thrust out her hand, almost forcefully. The older woman took her hand and shook it, and as she did, the girl's expression turned strong and penetrating, full of purpose. Her hand was cold. Elsewhere in the room, a camera snapped. Dim lights glowed in far corners, draping tasteful ambience over the plush chamber. Against the city’s jagged skyline, two older men were engaged in heated conversation. "I don't know, Sioras. Advisors to the Federation? It sounds a bit pie-in-the-sky to me. You don't think his motives might be spurious in the least?" "No no, listen to me," said Sioras. "I'm just saying that if there's anything for us to be gained from the hoopla going on right now with Omura and CFU, then it would be with him." "But we'd essentially be turncoats." A note of impatience crept into Sioras's voice. "Think outside the box, Kanai. You and I have been doing this for decades. Our best days are behind us. We're basically just glorified financial advisors at this point. Sure, we'll work high level, but we won't be aiding the enemy. We'll just be economists, there to help bridge the rift between the two nations." Kanai said nothing. He looked out at the city, watched the skylarks ascend into orbit, lingered briefly on the erratic blinking lights of the skyscrapers in the fading dusk. "Think about it," said Sioras. "The political capital would be enormous. I mean, we could get back in the game. The Provists have enough internal trouble right now, anyway. They're not going to come hunting for us, least of all with the visibility we'll have. And besides, we're advisors. It's not like we'll be directly involved in affairs of the state." Sioras gave a small sigh, clasped his hands together. "Yeah. Look, I know where you're coming from. Don't think I don't. But consider it, at least. Give it a fighting chance. Didn't the Sustainability and Co-operation Conference do anything to soften your view on this?" "Tell you the truth," replied Kanai, "I was smelling deception right from the start of that little get-together. The pandering was so obvious. The cultural nods were revolting. You could tell they thought they were being subtle, too." Sioras nodded. "Well," he said, "our former compatriots have seldom been renowned for their nuance. Whatever the case may be in that regard, the facts of the situation speak for themselves, don't they?" "I don't know," said Kanai. "I see the opportunity, and it seems good. Even if there was blowback from the die-hards, we could probably weather it with PR. It's just…I just don't trust that little man. He's unreadable. You never know where you have him. Any minute now, I feel like he's going to tap me on the shoulder and politely inform me he's the actual father of my children." Sioras fixed him with an exasperated look, the kind only an old friend can bestow. "I'm going," he said presently, with a note of resigned finality. "So are Kormoken and Tikilo, along with a good deal of the Citadel old guard. Are you sure you don't want to give it a little more consideration?" "Well," said Sioras. "You think about it." "It's all over the wires, sir. The financial establishment is up in arms." In the warm interior of his personal quarters, Executor Tibus Heth, the highest-ranking man in the Caldari State, sat in a posture of frozen rigidity. "What's the extent of the damage, counsel?" he asked. "Well, sir… for one thing, right now Omura's got more on her plate than she can handle. Even if her name clears eventually, every one of her close associates will have distanced themselves too far by then to come back. And it's making people point fingers elsewhere. High-visibility employees are gone from two of the eight megas already. Federation media's playing it to the hilt, too. No punches pulled." "What are the repercussions for the CFU pension funds?" asked Heth, shifting slightly in his seat. "Well, sir," said the counsel, and paused. As if on cue, the holographic field bearing his image wavered slightly. "Net asset values are going to stay more or less intact, but if the current situation escalates any further the investors will most likely pull their money for political reasons. If enough of them do that, we're going to have a problem on our hands that I'm just not sure how we're going to deal with." "And the rest of the megas?" "Lai Dai and Kaalakiota are currently engaged in strenuous internal and external PR efforts, trying to make sure no one outside the very top tiers of command realizes they could stand a real chance of crumbling at the seams due to infighting. Like I said, they're really up in arms, sir." For a moment Heth sat, staring down at his lap and rubbing his calloused thumbs together. He stayed that way for a while, with his counterpart on the other side of the FTL link growing increasingly uncomfortable. Finally, the executor raised his gaze, face resolved, fingers locked in front of him. "Set up an inquiry. National scale and beyond. I want all figureheads closely monitored twenty-four hours a day. I want every single transaction routed through our headquarters for analysis. I want nothing to get by us. Nothing, do you understand me? We're going to clamp down on this thing hard, and we're going to start right now. I trust you know who to talk to for the wheels to be set in motion." There was a small pause at the other end. "Executor," the voice came then, "your wish is my command." "We just received word. Heth ordered a national inquiry. They’re starting with the financial institutions. No stone unturned. Being very vocal about it, too." "Just thought you'd want to know." The secretary allowed himself a brief grin. Jacus Roden flipped off his viewscreen, drew in a deep breath, released it. He leaned back in his seat, thought about the events of days past, and tried not to smile himself.